I like visiting Austin to look at art. Austin is nice. It's fun to be around hills every now and then. My sister and her family live there, and I like to visit them. And their cat. And as it happens, I was in Austin this weekend feeding their cat (and otherwise catering to its every whim). 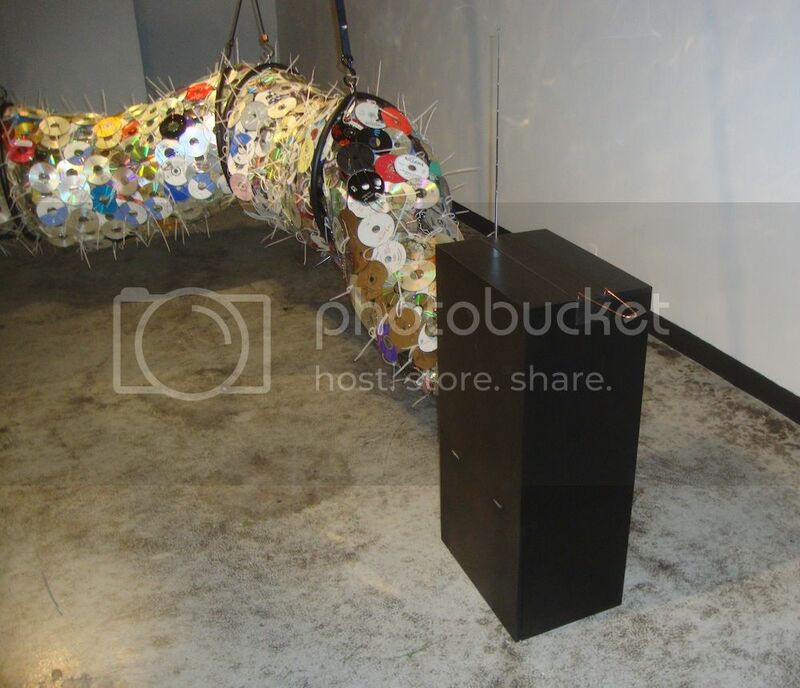 While I was there, I checked out the following art exhibits. Tiny Park: I wrote a separate post about this stop on the tour (guided on Friday night by the Virgil of the Austin art scene, Jaime Salvador Castillo). Rigoberto A. Gonzalez at the Mexican American Cultural Center: Great exhibit, fantastic venue (the MACC, which I was completely unaware of until Castillo took me there). This exhibit also got its own post. Lane Hagood at Domy: This show consists of three paintings and a 'zine, which was sold out by the time I got there, alas. I was shown a not-for-sale copy of the zine and it looked fantastic. It was about the ghost of James Ensor haunting Hagood. 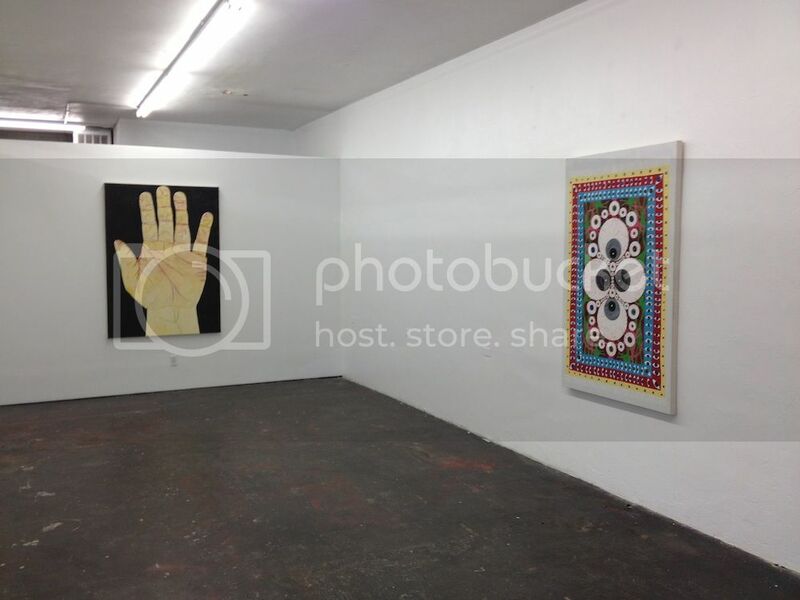 The show otherwise consisted of three paintings. This permitted an unusually roomy display--each painting got its own wall. Despite the paucity of paintings in the show, it was actually reviewed (or "picked") by Artforum. Soon Hagood will be too important (and too expensive) to hang out with the hoi polloi. I'm lucky I bought his work early--as I write this, I am looking at a Hagood painting hanging over my desk. I have two comments about the Eyeball Rug. 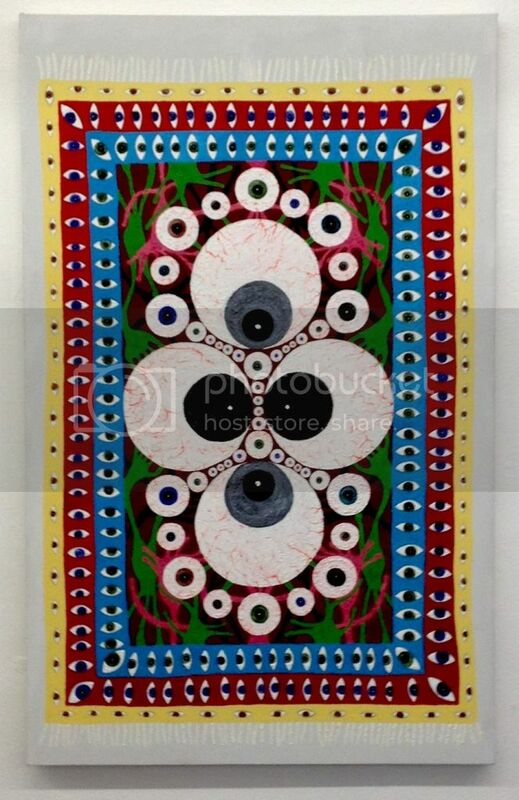 First, I wonder if Hagood had been reading Jim Woodring before he painted this, because Woodring included an eyeball rug (whose eyes follow the protagonist) in a story. The second point is related. Why is this a painting? Why not make an actual rug? This could be the beginning of a whole line of Hagood designed home furnishings. I don't know about you, but I would love to have a real eyeball rug. The Vogels at the Blanton Museum: You've seen Herb and Dorothy, right? Well, if you haven't, it's playing in the Blanton Museum in the same gallery displaying the 50 pieces of art given to the Blanton from their collection. Briefly, Herb and Dorothy Vogel, a mail clerk and reference librarian, respectively, started collecting art in the early 60s. They were enthusiastic collectors of minimal and post minimal art, and often bought less expensive items (drawings instead of paintings) directly from the artists. They had good eyes and were often quite prescient in their purchases (they were the first people to buy a Sol Lewitt, for example). The legend of their collection grew, and they offered it to the National Gallery. But their collection was too large for even the National Gallery to accept--it took about 1000 pieces of the Vogel's collection. Then they came up with the idea of donating 50 pieces to institutions in each of the 50 states. In Texas, the Blanton Museum was the museum selected to receive the Vogel's gift. These 50 pieces are currently on view there. Herb and Dorothy are my heroes. I actually get choked up when I imagine their life of heroic collecting on a budget and the astonishingly non-greedy way they chose to dispose of their collection. 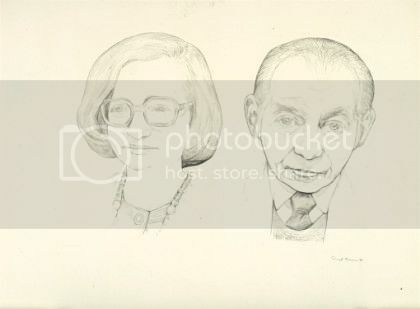 Daryl Trivieri, Untitled (portrait of the Vogels), 1998, charcoal on paper 22 1/2" x 30 3/16"
While they focused on minimalism and post-minimalism, they actually had quite catholic tastes. The show at the Blanton reflects that. 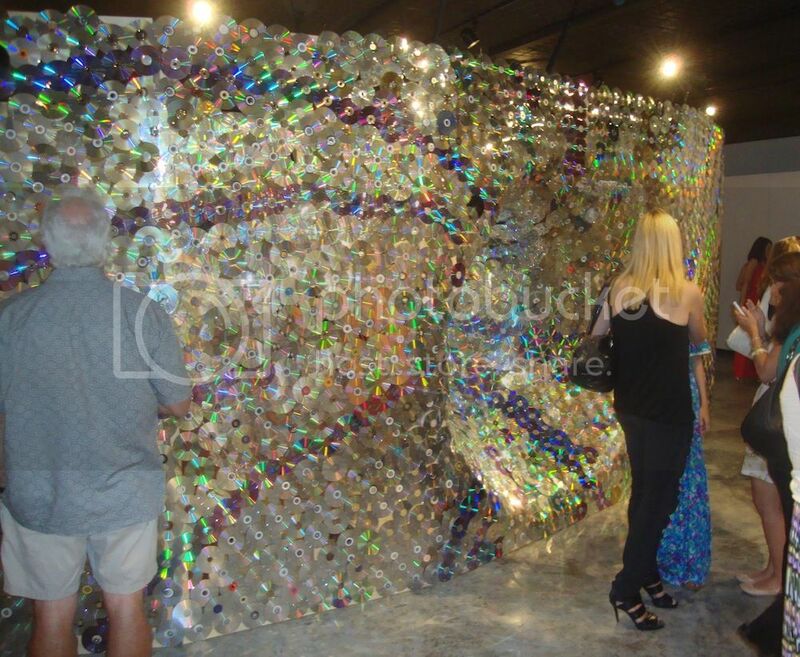 But it also reflects that they had their favorites--particularly Richard Tuttle. 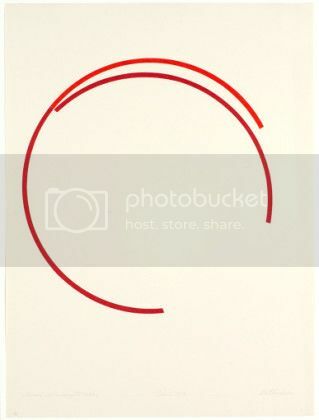 Sixteen of the 50 works given to the Blanton are Richard Tuttle pieces--usually watercolor on small pieces of of paper. 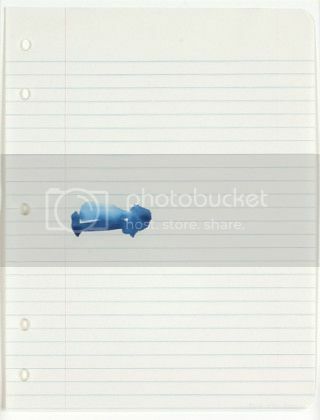 Richard Tuttle, Loose Leaf Notebook Drawings - Box 8, Group 28, 1980-82, watercolor and graphite on loose leaf notebook paper (ruled; hole-punched), 11 7/16" x 8"
The way they handled their collecting was that her salary paid for their living expenses while his paid for the art. And while that added up to a tidy sum over the years, the fact is that any given Sotheby's contemporary auction will see more cash change hands in a single night than the Vogels spent on art in their entire lifetime. And yet, they ended up with one of the greatest art collections in history. 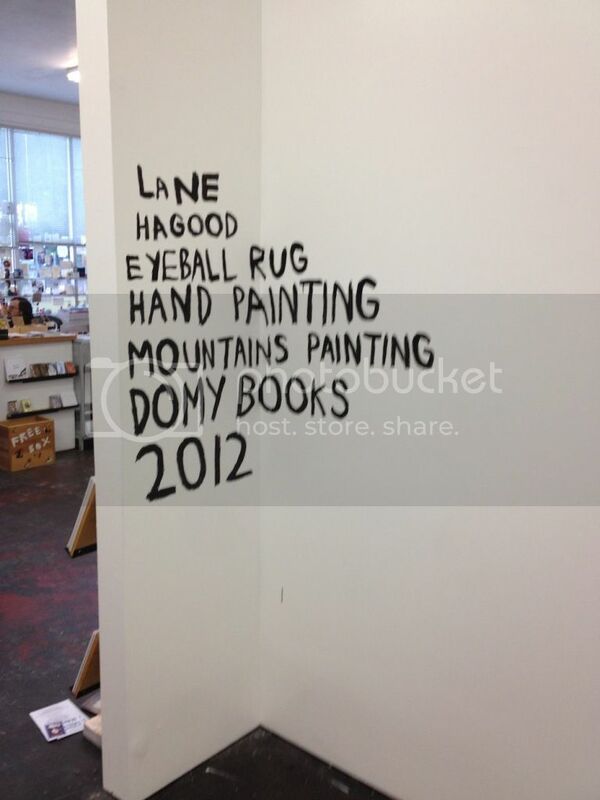 This should be a lesson for all you art lovers out there who are too intimidated to buy art. You can do it. The Vogels did on a very modest income. Stephen Antonakos, Ruby and Red Incomplete Circles, 1976, graphite and colored pencil on paper, 29 15/16" x 22 5/16"
While the Vogels had an uncanny ability to pick "winners," the fact is that a large part of their collection consists of work by artists that don't make the art history texts. It's easy to see how Stephen Antonakos fits in with their collection, but until I saw his series of incomplete circles at the Blanton, I'd never heard of him. Indeed, the Vogel's collection might inspire some new scholarship about some of the lesser-known minimalists and other artists front he 60s and 70s. 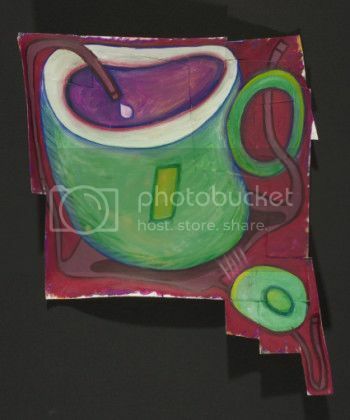 Elizabeth Murray, Green Cup - Brown Table, 1999, paper collage, with gouache and watercolor, 11 3/4" x 9 1/4"
But as I said before, it's not all minimalism. Not every piece is so severe. This beautiful little Elizabeth Murray painting, for example, exemplifies the playful, rubbery qualities of Murray's work. The Collecting Impulse will be up until August 12, but the pieces will be part of the Blanton's permanent collection. The Vogel's 50x50 is an almost unimaginable gift to the people of America, particularly in this age of greedy, narcissistic collectors with their own private museums. 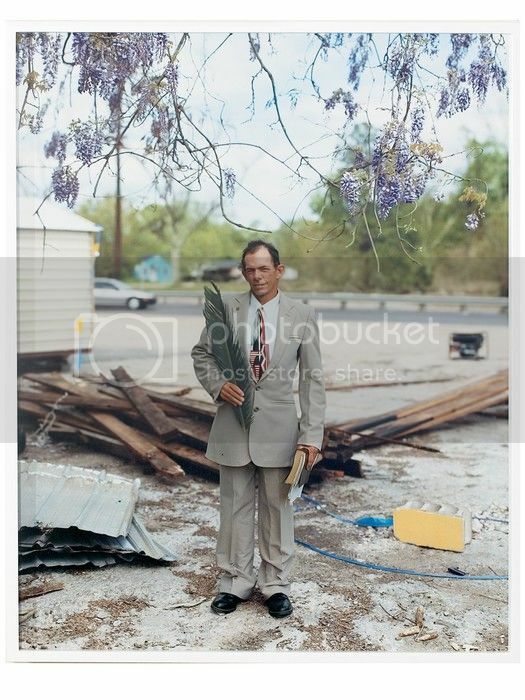 Alec Soth Patrick, Palm Sunday, Baton Rouge, Louisiana, from Sleeping by the Mississippi, 2002, chromogenic color print, 32" x 40"
This whole thing is kind of strange. The museums that display this exhibit are all secondary or tertiary museums. This show is cheap to put on--I'm assuming RBC pays for most of it, and no curator is required. But there is something feels off about displaying a bank's art collection in a public museum. I feel a little uncomfortable when a big name collector does this--a commercial enterprise doing it seems all the more skeevy. I don't think art exhibits should be giant advertisements. But that's what this feels like to me. Kerry James Marshall, Blind Ambition, 1990, acrylic and collage on canvas, 84" x 55"
The problem is that viewing this exhibition that way is to deny its actual virtues--or perhaps a better word would be "pleasures." The art included in The Human Touch is appealing, interesting and occasionally beautiful. The Chuck Close silkscreen John (a portrait of John Chamberlain), for example, had a shimmering active surface, colors in contrast with one another and yet still creating an ultimate unity--a portrait of the master sculptor. 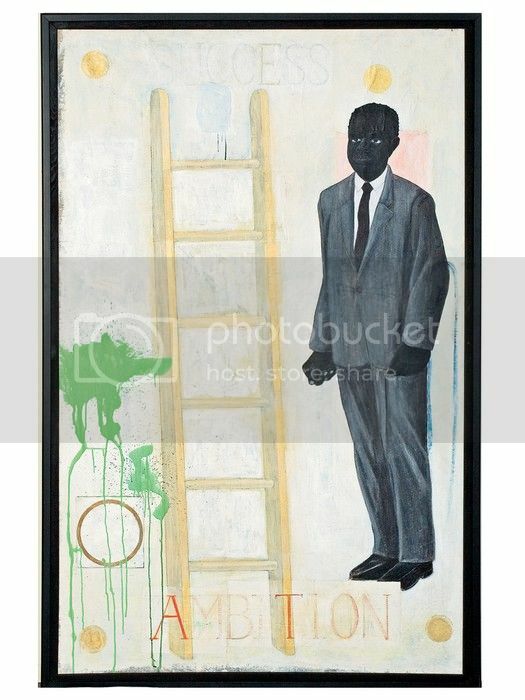 Kerry James Marshall's Blind Ambition cleverly spoke to the complexity of "climbing the ladder" and "colorblindness" in terms of the African-American experience. There is a powerful John Ahearn plaster sculpture in the exhibit. In short, whatever my misgivings, I liked the art on display. But one final note--it is interesting to contrast the work shown in The Human Touch and the in the Vogel's collection. The Vogel's, to my mind, were much more adventurous collectors than RBC Wealth Management. Leticia Bajuyo at Women and their Work: Technology and obsolescence underlie Event Horizon by Leticia Bajuyo. It consists of two structures that have each other. 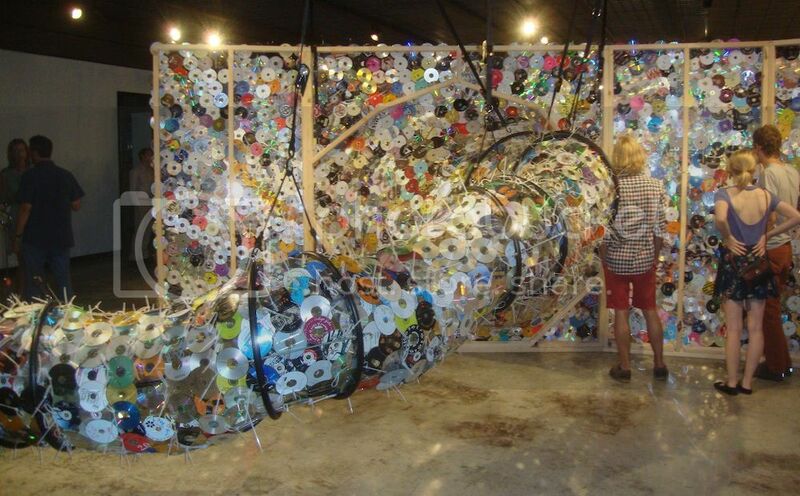 Each structure consists of a theremin and thousands of CDs tie-wrapped into the form of a snakey funnel. The two wide parts of the funnels face each other. The theremins are each at the narrow part of the funnel. In theory, the funnels could act as amplifiers, but I suspect there is too much noise leak for them to be effective. 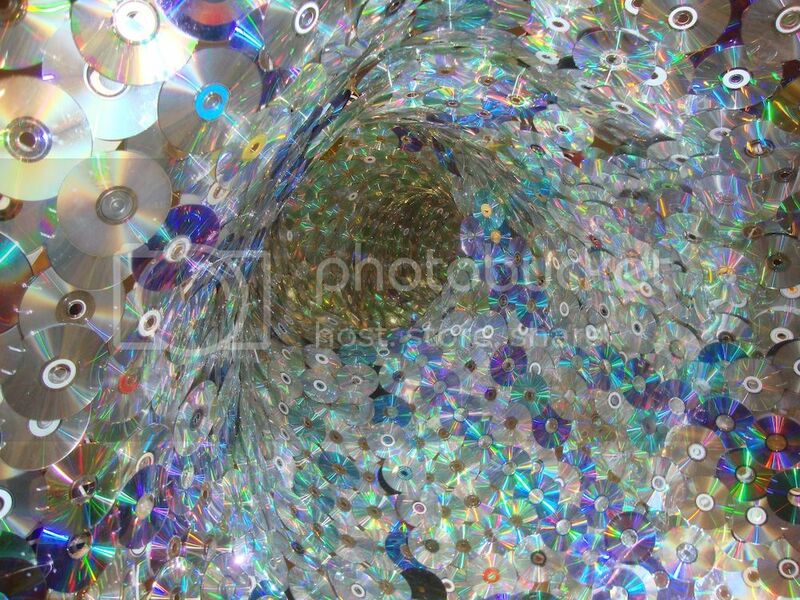 As a conceptual piece, Event Horizon seems pretty obvious--even heavy handed. But as an object, it's quite beautiful and intriguing. And people loved playing with the theremins--especially kids. In short, while it doesn't succeed on all levels, it succeeds enough.